Change shoes as often as possible so that the leather could breathe and get aerated. This is vital to the evolution of the upper. Everday use a wooden pair of shoetrees – with a preference for a one made in raw wood – of your choice in order to tighten the leather and smooth out the pleats. Before applying your maintenance products, check beforehand whether the leather is clean. With a slightly dampened cotton cloth clean the surface of the shoes and leave it to dry as long as needed. First apply a colourless care cream in order to thoroughly nurture the leather. With a small piece of cotton make the cream penetrate by circular motions. Press slight more on the pleats, where the leather is the most worn. Leave it to rest for several minutes, then with a horsehair brush remove any surplus of cream. This also helps to polish the leather. 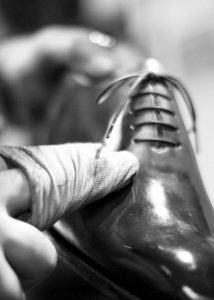 Note that the care cream – in the case of your patinated Altan shoes – always has to be colourless, so that the patina will not be altered. Your patinated shoes have to be glazed. Indeed, it is also glazing that helps reveal all the hues of your patina. Use a shoepolish specifically dedicated to glazing.With a 100% coton cloth apply the polish in circular motions, primarily on the hard toe-puffs and stiffeners. Leave them to rest, then with little water drops added directly on the leather covered with the polish, the glazing will take place. It is likely that after the very first several steps in your shoes, a small residue of flakes appear near the pleats. This is due to a surplus of glazing. With a small piece of cotton apply again some colourless care cream and polish with your horsehair brush in order to remove this residue. as well as our traditional cobbler services. Or contact us directly for all questions related to your shoes.